Like the 1984 Japanese Eat It and The Official Music Of "Weird Al" Yankovic compilations, The Saga Begins contained the parodies from a recent U.S. album (Running With Scissors) that was not issued in Japan. 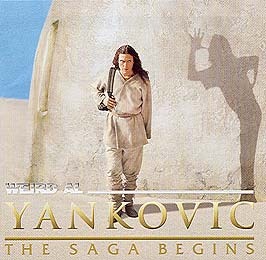 Like the European "It's All About The Pentiums" CD single, this album also contained a computer video file of "The Saga Begins" video. In addition to the release date, another date that appears on the CD case and OBI strip is November 30, 2001. Perhaps this was to indicate when the CD would cease pressing? The lyrics for "Polka Power!" are printed in the liner notes in both English and Japanese. For those of you who may be curious, Al's own "Way Moby Polka" composition officially begins in the medley with the "Cause it's closing time" line. The Japanese lyrics for "It's All About The Pentiums" contains footnotes explaining (in Japanese) the terms "troll," "spam," "alt.total-loser," and (we believe) "Cracker Jacks." The first Al product released in Japan by the Avex Group, ending Al's twelve-year relationship with (Pony) Canyon Records (the last release through them was Bad Hair Day). The Saga Begins ©1999 Way Moby/Volcano Entertainment III. ©1985 CBS, Inc. ©1987, 1988, 1993 Scotti Bros. Records. ©1992, 1996 Rock n' Roll Records/Scotti Bros. Records.